St John’s Church, New Barnet, 31st July. 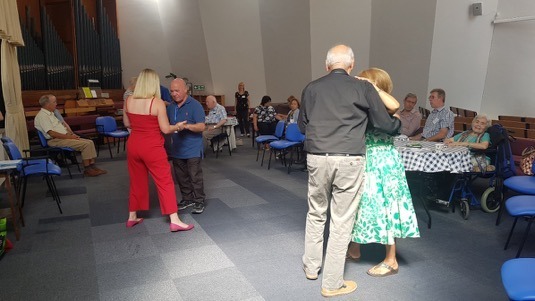 The number of members who came to this month’s session was much higher than last month and they all had a fantastic time. The session started by welcoming the members and offering them teas and coffee plus biscuits. Dementia Club UK were then presented with a £300 donation from the Rotary Club of Barnet. The money donated was raised during the selling of plants in the East Barnet Festival on the 7th and 8th of July. 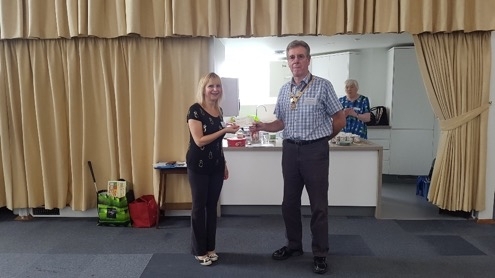 Lisa was delighted to receive this money and announced that the money will be used to go towards the official launch of Rotary Club of Barnet dementia club. The members were then asked to take part in a quiz. They were asked to identify the names of 12 images. Richard then did exercise yoga with the members. The colourful beanbags were used again as part of the exercises and it was very enjoyable by all the members. 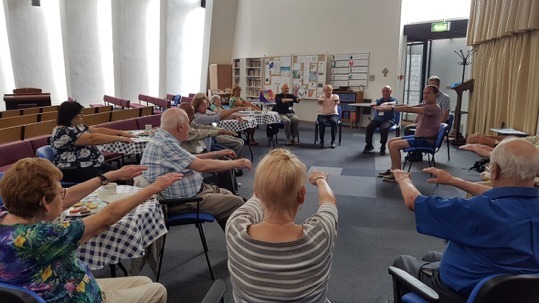 The yoga session then followed with Clare singing her usual popular songs and all members had a lot of fun by singing and dancing. Thank you to our church volunteers making teas and coffees and setting up the venue; Dorothy, Brenda and Andrew. Thank you to our Rotarians from Barnet; Jim (President), Malcolm, Victor, Simon, Brian and John with his wife Amalia, plus Sasha from the Rotary Club of Elstree and Boreham Wood Studio. Also thank you to our Dr Rebecca Hatjiosif.